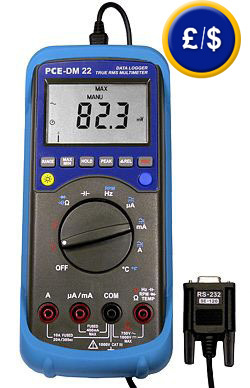 The handheld Multimeter PCE-DM 22 is a device which covers almost all your needs. Along with determining DCV, ACV, DCA, ACA and resistance accurately, this multimeter also determines capacitance, frequency, revolutions and temperature, as well as does continuity checks and diode tests. Data can also be transferred to a computer with the help of included software and data cable. The integrated data logger function allows the user to take measurements over a duration of time in machines and electrical installations. This handheld multimeter comes calibrated from the factory and an ISO calibration with laboratory calibration can be ordered with the device or as an annual recalibrations. 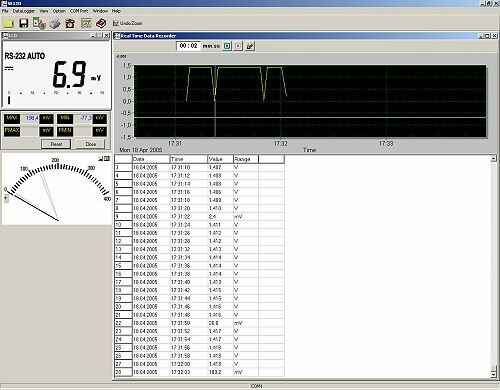 There are other models of multimeters with multiple functions, graphics, RS-232 interface and software which can be seen here. If you require a multimeter that measures capacitance, frequency and temperature, we recommend the W-20-TRMS. Furthermore, this link contains an overview of all the available multimeters. Testing continuity of the ground in a vehicle. 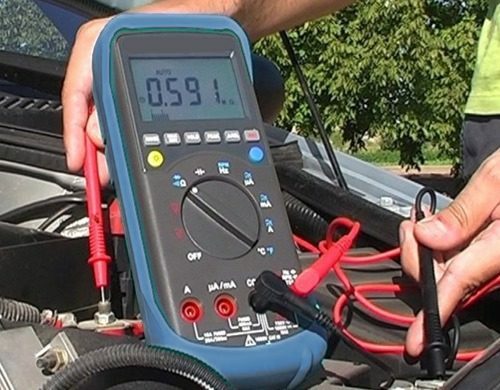 The complete electrical circuitry of a vehicle can be tested with this multimeter (battery voltage, testing of cables, fuses, etc). Graphic representation of a series of measurements taken with the Multimeter PCE-DM 22 .